Servos seem to be the go-to option when adding motors to hobby projects. They’re easy to hack for continuous rotation for use in a robot, but with the control board intact they are fairly accurate for position-based applications. But do you know how the hardware actually works? [Rue Mohr] recently published an article that looks at the inner world of the servo motor. As you know, these motors use a voltage, ground, and signal connection for control. The position of the horn (the wheel seen on the servos above) is dependent on that control signal. The duty cycle of a 20 ms pulse decides this. Inside the housing is a control board capable of measuring this signal. It’s got a chip that monitors the incoming PWM pulses, but that’s only half of the equation. That controller also needs feedback from the horn to know if its position is correct or needs to be changed. Integrated with the gear box that connects the motor to the horn is a potentiometer. It’s resistance changes as the horn turns. Knowing this, it is possible to fine tune a servo by altering that resistance measurement. Get your feet wet with radio frequency transmitters and receivers by working your way through this pair of tutorials. [Chris] built the hardware around a couple of 555 timers so you don’t need to worry about any microcontroller programming. He started by building the transmitter and finished by constructing a receiver. Apparently the 27 MHz band is okay to work with in most countries as long as your hardware stays below a certain power threshold. The carrier frequency is generated by the transmitter with the help of a 27.145 MHz crystal. The signal is picked up by the receiver which uses a hand-wrapped inductor made using an AL=25 Toroid Core. We’d say these are the parts that will be the hardest to find without putting in an order from a distributor. But the rest of the build just uses a couple 555 timer chips and passive components, all of which will be easy to find. The video after the break shows the project used to receive a Morse-code-style message entered with a push button. It would be fun to interface this with your microcontroller of choice and implement your own one-way error correction scheme. Here’s a project that is striving to develop a set of open source finger prosthesis. They are aimed at patients who have partial amputations. 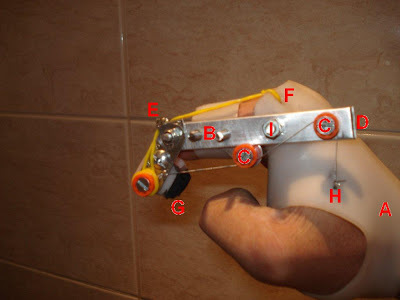 This means that part of the digit remains and can be used as the motive force behind a well designed mechanical prosthesis like you see above. This uses levers, pulleys, and wire to move a gripper in much the same way the pad of a pointer finger works. There’s even a video (embedded after the jump) which shows it being used to grab a toothpick from a dispenser… pretty impressive. This is similar to the prosthesis we saw in August which managed to work without pulleys and wire. This isn’t limited to fingers. The same posts that shows off the unit seen above also includes a prosthetic thumb. The leverage for that design is provided by a woven nylon strap which attaches to a bracelet on the wrist. This hack is quite common, but it’s still fun to see what hardware is being outfitted with an inductive charger. This time it’s a Nokia N900 that’s ditching the charging cables. This Wii carrying case (translated) looks great and cost just a few bucks. It started as a tackle box for carrying around your fishing lures. But a bit of creative cutting and there’s a place for everything. Halloween rapidly approaches and we hope that [Tim’s] carving of Bender in a pumpkin will inspire you to send in your own Halloween projects. The Commodore SID was the audio chip in the venerable Commodore 64 and in the 30 years since release has attained classic status and become one of the best ways to get your chiptune on. Designed by famous synthesizer designer [Bob Yannes], it was only a matter of time before we saw a real, homebrew MIDI synth based on the Commodore SID. Because real SID chips are rare as hen’s teeth nowadays, [Jeff Ledger] built his SID synth around an emulated system running on a Pocket Mini Computer. This very cool microcontroller platform runs on the Parallax Propeller. An emulated SID runs in one of the Propeller’s 8 cores, with the remaining cores kept open for reading MIDI notes and displaying info on a display. The hardware portion of this build is amazingly simple; just an optoisolater, a few resistors, and a diode connect a MIDI keyboard to the Pocket Mini Computer. The buttons and dials on [Jeff]’s MIDI keyboard control the waveforms, filters, and envelope controls. A very neat setup if we do say so ourselves, and just perfect if you’re needing more chiptunes in your life. You can check out [Jeff]’s video after the break.